Juliette Stehlé, Nicolas Voirin, Alain Barrat, Ciro Cattuto, Vittoria Colizza, Lorenzo Isella, Corinne Régis, Jean-François Pinton, Nagham Khanafer, Wouter Van den Broeck, and Philippe Vanhems. BMC Medicine, 9(87), July 2011. The spread of infectious diseases crucially depends on the pattern of contacts between individuals. Knowledge of these patterns is thus essential to inform models and computational efforts. However, there are few empirical studies available that provide estimates of the number and duration of contacts between social groups. Moreover, their space and time resolutions are limited, so that data are not explicit at the person-to-person level, and the dynamic nature of the contacts is disregarded. 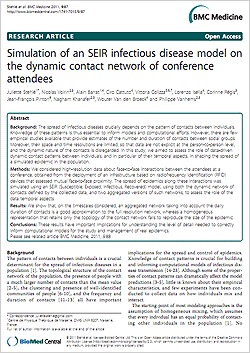 In this study, we aimed to assess the role of data-driven dynamic contact patterns between individuals, and in particular of their temporal aspects, in shaping the spread of a simulated epidemic in the population. We considered high-resolution data about face-to-face interactions between the attendees at a conference, obtained from the deployment of an infrastructure based on radiofrequency identification (RFID) devices that assessed mutual face-to-face proximity. The spread of epidemics along these interactions was simulated using an SEIR (Susceptible, Exposed, Infectious, Recovered) model, using both the dynamic network of contacts defined by the collected data, and two aggregated versions of such networks, to assess the role of the data temporal aspects. We show that, on the timescales considered, an aggregated network taking into account the daily duration of contacts is a good approximation to the full resolution network, whereas a homogeneous representation that retains only the topology of the contact network fails to reproduce the size of the epidemic. These results have important implications for understanding the level of detail needed to correctly inform computational models for the study and management of real epidemics. This paper was accompanied by a commentary by Sally Blower and Myong-Hyun Go.